← Playland Salutes First Responders on Final Weekend of its 90th Season. 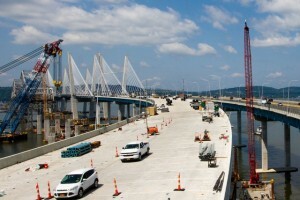 ALL WAS IN READINESS FRIDAY AFTERNOON FOR THE NEW EASTBOUND SPAN OF THE NEW MARIO CUOMO BRIDGE TO OPEN SATURDAY. THE U.S. COAST GUARD HAS CLOSED THE EASTERN SHORE CHANNEL OF THE RIVER TO VESSEL TRAFFIC DUE TO THE POSSIBLE HAZARD TO SHIPPING AND RIVER VESSELS SAILING NORTH THROUGH THE EASTERN CHANNEL OF THE HUDSON BELOW. WPCNR COUNTY CLARION-LEDGER. From the Westchester County Department of Communications and WPCNR News Summary. September 9, 20118. “Westchester County Police became aware of the situation with the old Tappan Zee structure late Friday night. The County immediately stepped into action, and the County Police Marine Unit was deployed to help stop river traffic from going near the old structure. We continue to work closely with State officials, and are in constant conversation with engineers on the scene. The safety of Westchester County residents, and all travelers, is our top priority. The remaining Tappan Zee was continuing to be dismantled by work crews and a piece of the former bridge became “destabilized,” Matthew J. Driscoll, the executive director of the New York State Thruway Authority, said in a statement on Saturday. Work crew members demolishing the old bridge heard a “loud pop” about 5 PM Friday in the structure, Terry Towle, the president of Tappan Zee Constructors, told reporters last night (Saturday). Towle said there might be problems with joints that could have theoretically caused the old bridge to fall toward the new eastbound span, which is 160 feet away, he said. Saturday afternoon, Gov. Andrew M. Cuomo said a damaged and rusted piece of the old bridge was the problem.